I am trying to make sense of a cactus conundrum and would appreciate if knowledgeable cactus growers would shed some light. 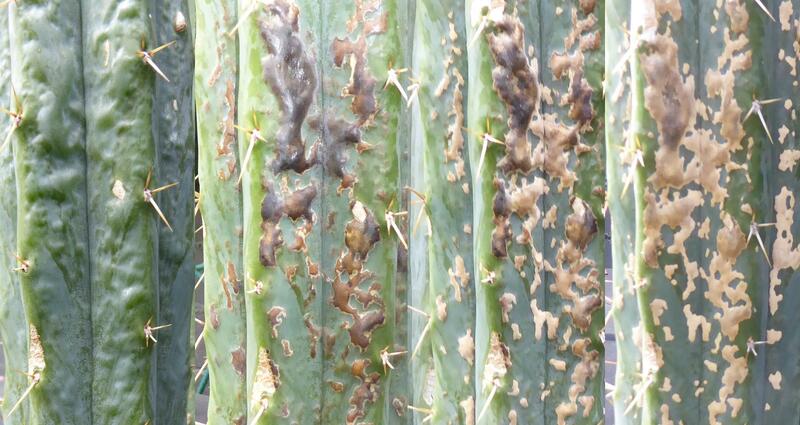 The cacti in the last 2 pictures were hit by spray from a hose which may have caused physical damage, but otherwise they seem to be disease and pest free. The markings are only on the side of the cacti that faced the spray. None of these bumps exude liquid or are turning black etc and no chemicals have been used on or near the cacti. I am curious to know if this is a contagious disease (and if so, what steps to take) or if it is nothing to worry about. Hey there. 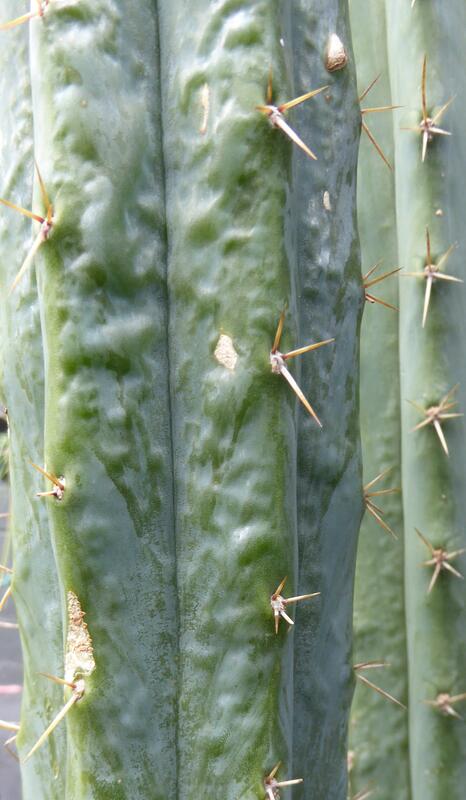 I see this type of lumpy skin (which often goes black then turns to corking like your first photos) particularly on pachanoi and a select few bridgesii in my garden. It seems to happen in very hot weather. During summer I spread dolomite lime around my in ground plants and a few words them did this a day or two later. It doesn't ever spread, it's not harmful but it's a bit unsightly. I wouldn't stress over it. Thanks for the info Glaukus and motherfirefly . I have given them a feed and it hasn't spread, although the lumps have turned black and will probably cork as Glaukus mentioned. When I was trying to figure out what caused it I watched the above vid which shows similar bumps as on mine. 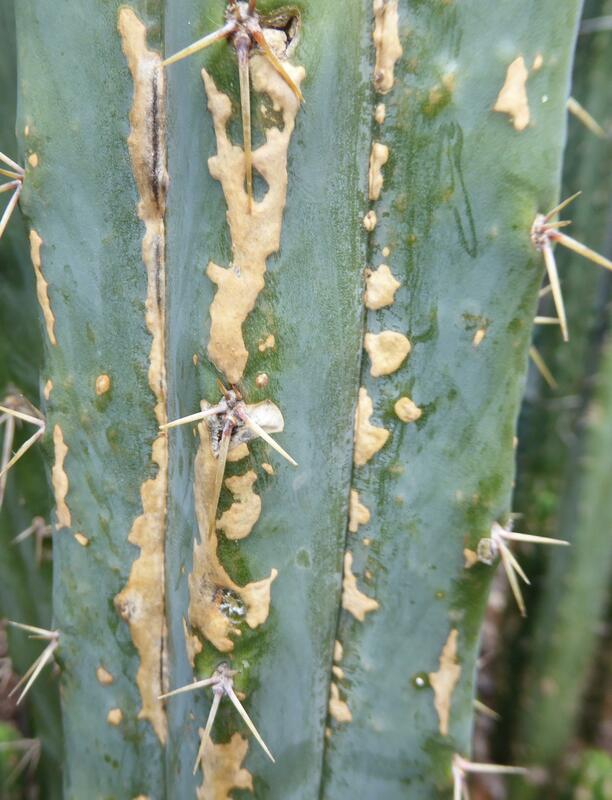 It says that chemicals / physical damage somehow react with alkaloids beneath the skin of the cacti and cause the black pustules that ooze and then cork. They also claim that it occurs mainly on Trichos but also other cereus. This seems to suggest that alkaloids are released from compartments by chemical or physical damage, causing necrosis at site of injury. It's interesting because if these alkaloids exist to deter pests from eating the plant, an animal tearing into a cactus would be bound to cause extensive death of tissue which may be a vector for disease. Even an insect bite could threaten the plant. It seems like it's a necessary trade-off from an evolutionary perspective which makes me think the black liquid / ooze has antifungal and antibacterial factors or that the cork forming through this process is important to survival. I am not a fan of the theory that says alkaloids exist to deter animals from eating them. I've had deer and roos/wallabies eat them to ground level without pause. The bitterness might put off possums but not many other animals. Good point, I don't know why I assumed that's why they exist. I have not read about the function of alkaloids in cacti so won't comment on that but I'd like to point out that evolution doesn't really work that way. For instance, the most toxic frog in the world evolved to be that way because the snake that eats it became resistant to the toxin, and so only the most toxic of these frogs survive. The snake eats these frogs to survive but if enough of the frogs contain a certain amount of toxin, the snake numbers decline and the frogs become more abundant. But whist most snakes die, some individials are more resistant to the toxin and these prosper without competition from other snakes and a now abundant resource of frog availability. So those genes are selected for. This cycle has continued for a very long time and these frogs are now incredibly deadly to all but this snake, whilst this snake has an incredible ability to metabolise toxins that no other organism can. It's an evolutionary arms race of attack and defense. Defense stratergies are expensive and not productive unless required. 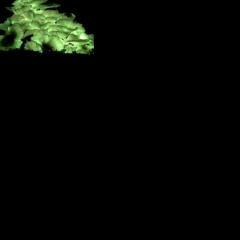 Their existence is dependant on them being attacked and evidence of herbivory paradoxically supports this hypothesis. *Edit* Pseudo Mexican, sorry I am unable to help you with your cacti and took this thread off course .